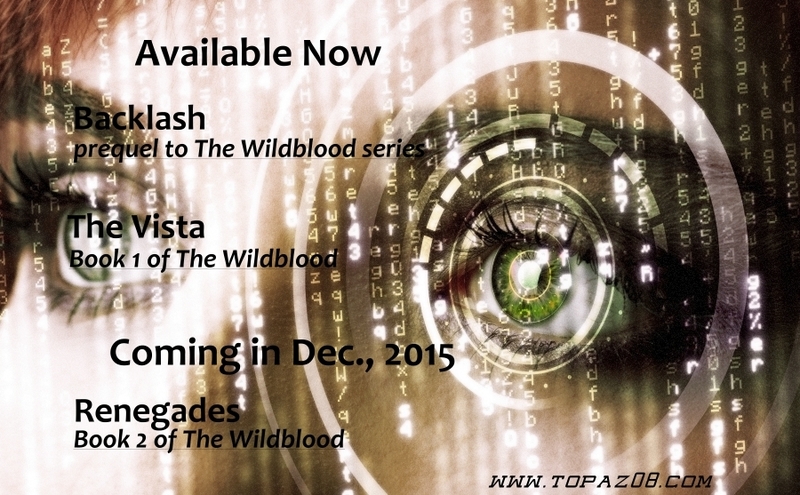 I still plan on releasing Book 2 of The Wildblood series in December. Tentative title is Renegades. With everything going on in real life, that may get pushed back, but it won’t be a lengthy delay. A promo, because I’ve been slacking. If you want, follow the link for Backlash – it’s free on Amazon even tho I tried to change it back. Ah well. With a little luck, I’ll have a sneak peek at the new stuff soon. Any good prayers/thoughts/vibes would be appreciated for us on Friday. Test results. Backlash (prequel to The Wildblood series) FREE for a limited time! The Vista (Book 1 of The Wildblood series) – Now priced at $3.99. 5 Star Review – “A refreshing change”, “edge-of-the-seat stuff”. Team Three is sworn to protect The Vista. The first generation post-war; Allen, MacKenzie and Wade are different, and it’s a secret they struggle to contain. They have failed – someone dangerous is out there, watching them. Real Life has thrown a couple rocks at me recently. One is that my husband has a serious and sudden health problem. I haven’t been writing, or doing much of anything but getting through the day. It’s funny, how a few moments and a few words can change your life. I’m getting back in the routine of writing now. Book 2 of The Wildblood series was originally scheduled to be released in December of this year. I don’t have a clue if I can stick with that date, because the next few months are going to be complicated. I’m going to try. I just want everyone to know I haven’t disappeared or quit or anything like that. Hopefully I’ll have some regular posts next week, but it will be closer to the weekend. Prayers, good thought/vibes/whatever you do, I’d appreciate them for my family this week.